Today we're going to talk about how to correct entries in Dynamics NAV. The version of Dynamics NAV I'm using is 2017, and 2017 actually has some features that are new. So, I thought we would show you those new features and then talk about traditionally—if you don't have 2017--what are your options today for correcting Invoices or Payments or Ledger Entries that affect your Customer Vendor. And really some of these tricks will work for Bank Ledgers, Fixed Asset Ledgers, Item Ledgers, as well, beyond just Customers and Vendors. So, let's start. We'll look first at a Customer Record and take a look at the Ledger Entries for this customer. I'm in Clean Cronus, so I'll take a look at Cannon Group and drill down on to their Ledger Entries. If I need to get rid of one of these transactions or I need to adjust it, what are my options? Well, with 2017 we've got a couple of nice options. If I take a look at this $100.00 invoice first, I can come in here and Show Posted Document. From the Posted Document screen, I have the ability to correct. Under Actions, I also have the ability to Create a Corrective Credit Memo. What is the difference in those two? If I go back to Correct, correct will only work on Invoices where the Line Type is not a G/L Account. So correct will not work on this invoice for me. If this was an Item Type and the invoice was for types of items--such as inventory items—the Correct would actually automatically create a credit memo and off-set that posted invoice to bring it to zero. It will then recreate this exact invoice and bring it up for me on the edit screen to enable me to correct it and change it and make it right. This is a very good option if you put the wrong item on a customer's order--or have something else and you posted it--and you need to correct that invoice and change the item or change the quantity and resend it to the customer. The Correct is one of the best ways to do it. If, however, you just want to get that invoice out of there, the fastest way to do that would be to use Actions, Create Corrective Credit Memo. What that will do is create a credit memo and bring it open into the Edit Screen, and it will duplicate any of the lines, including Type G/L Account, and enable you to post a credit memo so that you can then go apply that to your Invoice and Ledger Enters. You could apply it on the Credit Memo Screen, as well. So that's an easy way to do the documents. Now what if I've got a payment or something besides an invoice that I want to reverse? I want to get this payment out of here for this customer. Again, I can go up to the menu bar and Reverse Transaction. The Reverse Transaction action will only work on ledger entries that originated from a journal. An invoice does not originate from a journal. It could, theoretically, but most of the time it originates from a document screen such as Sales Invoice or Sales Order. On the Payment row, payments do originate from a journal--and remember Journals are entries where all the entries are made on the individual lines. There's not a header and line combination. I can highlight my payment, choose to Reverse Transaction, and it will bring up and propose for me the complete reversal of that entry in my NAV system including the Customer Ledger Entry, G/L entry and Bank Account entry. I can simply hit Reverse, that will post the correction, and it will make it as if this payment was never entered for that customer in the first place. So that's an easy way to reverse any transaction that originated in a journal. Part of the challenge in Dynamics is knowing if my invoice was created and is of Type Item, then an option that I may have is the Correct option, the Correction option, option to Correct. Or I can go to Actions and hit Corrective Credit Memo. If my transaction originated in a journal such as this payment, then my option is to Reverse the Transactions. I’m going to show you one other option as well. And that is you can always correct a transaction inside of NAV using a General Journal. The General Journal transaction will enable you to post through to the subsidiary ledgers. I'll open up General Journal, leave the date, and change Account Type to Customer. Next I'll pick my customer. All I need to do now is create the amount. Post the amount into the customer account. Now, notice that I'm going to keep the Document Type blank--even if I'm reversing a payment or an invoice. I suggest you keep the Document Type blank by selecting Document Type. The system will start to enforce some rules in regards to the type of accounts and the amounts that you can post. So, if you keep that Document Type blank--that's a little tip--that will let you get past that. Now, as always, entering a General Journal transaction, the positive and the negative has to do with how it’s going to be represented on your Trial Balance. The positive number being a debit, the negative number being a credit. In this case, if we want to reverse a payment from a customer, a payment hitting our Accounts Receivable account is hitting that account as a credit. As a result, I'm going to reverse the payment by entering a positive $10,000. I'm going to knock out my off-setting balancing account there and do it on two lines. Anytime you split to a second line, and you don't have to, keep your Posting Date the same and keep Document Type blank. Now the off-setting account, here. I can off-set this through my Bank Account or to a G/L Account. It doesn't matter. And if I want to off-set this to a Bank Account all I do is select--or I change it over there—select my operating Account, or Cronus. I'll enter a brief description there and do maybe the $10,000. I've got to delete that balancing account as well. This Journal Batch for CASH is defaulting—my balancing account—and that’s ok. Now I’m in balance. It’s going to take $10,000 out of this bank account and it's going to put $10,000, as owed, back into this Customer Ledger. This transaction, once posted into the Customer Ledger, will enable me to apply those transactions just like a payment or an invoice anywhere else. So, all I have to do is post that transaction. I'll go ahead and post it and we can take a look at it up there and in the customer card. Notice that that posted with no problem. And now when I go out, back to my Financial Management and Receivables and the Customer Account, I'll see that transaction out there. So, here on the Canon Group, we'll take a look now at their ledger entries. And now I can see my General Journal Transaction. They owe me $10,000 again because I reversed part of this credit memo or a part of the payment. You can always use a General Journal to reverse any transaction. And you can put amounts into the Customer Ledger or take them out of the Customer Ledger based on whether that's a positive or negative entry in that General Journal. Remember to determine that, you have to come back to how it looks, how it hits the Trial Balance. So those are your options for making corrections in Dynamics NAV. 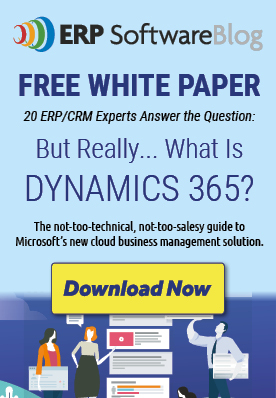 Is Now The Best Time Ever To Buy Microsoft Dynamics NAV?